In tinnitus associated with inner ear damage, and especially that due to noise, it seems reasonable to expect that deficits in inner ear function should be present at the same frequency as the tinnitus. This conjecture offers a possible for adding objective evidence to substantiate the existance of what would otherwise be an intrinsicially subjective phenomenon. Because tinnitus can be a single tone, at nearly any pitch, one really needs to quantify inner ear function at all frequencies. Unfortanately, it is impractical to test hearing in a continuous fashion because each single frequency takes roughly a minute to test. To test hearing in a very fine grained fashion, one would need to spend hours. Another approach is to use a "sweep OAE". This is how it works. In our practice in Chicago, we evaluate tinnitus by "pitch matching" using an audiometer that can generate tones at very high resolution (Madsen Astera). In the following case, we "pitch matched" the tinnitus to 9900 Hz who developed unilateral tinnitus after an automobile accident. In the same patient, we used a extremely high resolution "sweep OAE" device, which measures outer hair cell function in the ear. The outer hair cells are very vulnerable to noise. 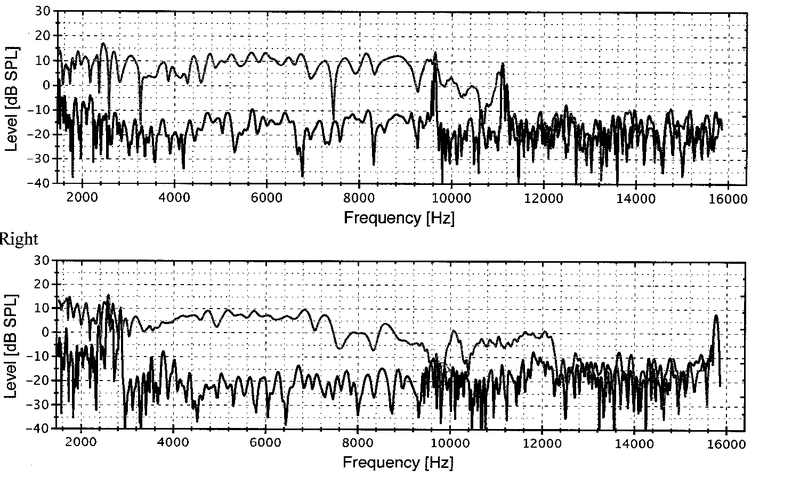 For the left ear (top), OAEs (the difference between the top and bottom trace) are excellent up to roughly 11,000 Hz. For the right ear, there is a dip in the OAE between 9000 and 10,000 hz. This suggests that there was outer hair cell damage at the same location using an objective test as had already been localized using a subjective test (audiometry). This technique might be useful for medico-legal situations where there is noise trauma and tinnitus.